Heat oven to 350°F. Mix butter, sugars, vanilla and eggs in large bowl using spoon. Stir in flour, baking soda and salt. Stir in chocolate chips. Drop dough by rounded measuring tablespoonfuls about 2 inches apart onto ungreased cookie sheet. Bake 12 to 15 minutes or until light brown. Cool slightly. Remove from cookie sheet to wire rack; cool. Butter can make things better—in cookies. 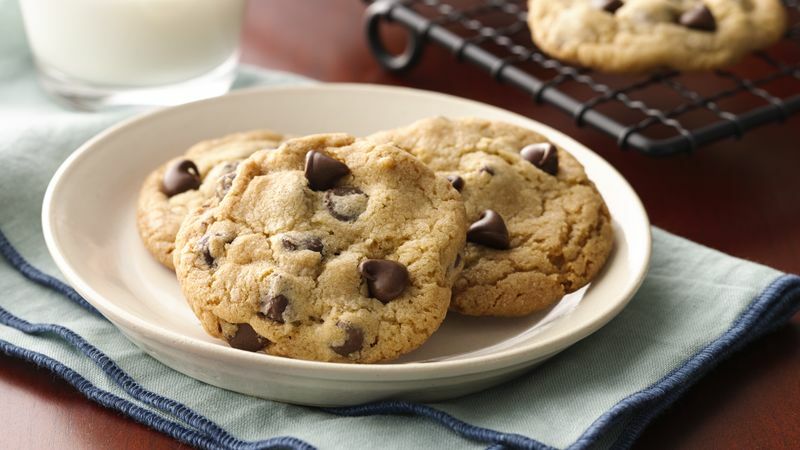 If you like crisp, rather than soft and chewy, chip cookies butter is the right choice. Don’t use tub butter or reduced-calorie butter substitutes; they don’t work well in baked goods. Go for the real thing. Avoid using rimmed jelly-roll pans, they block the hot air from circulating around the cookies properly. Invest in a couple of heavy, flat baking sheets that won’t buckle when they go into a hot oven. Line your baking sheets with parchment paper—keeping the pans clean and guaranteeing nothing will stick. Reuse the paper again and again. If you want to bake two pans at the same time, be sure to rearrange the oven racks before you turn the oven on. Then rotate your pans from the top rack to the bottom rack halfway through baking so the cookies brown evenly.